Kevin Michael Holzman serves as the Director of Wind Studies at the University of Cincinnati College-Conservatory of Music. Holzman joined CCM’s faculty on a visiting basis in 2017 as the Assistant Director of Wind Studies, and assumed the Director of Wind Studies position in August 2018. As Director of Wind Studies, Holzman serves as the music director for the CCM Wind Symphony (CCM’s premier large wind ensemble), the CCM Chamber Orchestra, the CCM Chamber Winds, and the CCM Bras Choir. His academic responsibilities include teaching graduate conducting, survey of wind literature and related courses as well as the advising and mentoring of wind conducting students in CCM’s MM and DMA programs. 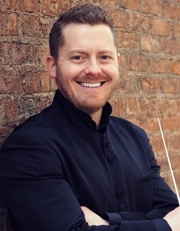 Prior to his appointment as Visiting Assistant Director of Wind Studies at CCM, Holzman earned his Doctor of Musical Arts degree in conducting at the Eastman School of Music, where he studied with Music Director of the Eastman Wind Ensemble, Mark Scatterday, DMA. As the Frederick Fennell Conducting Fellow and 2016 recipient of the prestigious Walter Hagen Prize for Excellence in Conducting, Holzman served as Associate Conductor of the world-renowned Eastman Wind Ensemble and Eastman Wind Orchestra. He regularly appeared as a conductor for OSSIA New Music, including multiple world-premiere performances. He also studied extensively with Neil Varon, Director of Eastman Orchestras. In summer 2016, Holzman was invited to serve as an associate conductor on the Eastman Wind Ensemble’s first tour in Europe, where he conducted the Eastman Harmonie in Salzburg, Vienna and Prague. He also collaborated with prominent composers David Maslanka and Bert Appermont for the “Celebration of the Symphony” concert with the Eastman Wind Ensemble. The performance was Eastman’s first live-streamed large ensemble concert, which included the North American premiere of Appermont’s Symphony No. 2 The Golden Age. Holzman also served as an Assistant Producer for the Eastman Wind Ensemble’s recent release Sierra Live and upcoming album featuring the music of Jeff Tyzik. Beyond Eastman, Holzman has worked with professional ensembles including the United States Army Band “Pershing’s Own” and the Rochester Philharmonic Orchestra. In April 2017, he was appointed conductor of the Music in the American Wild ensemble, a National Endowment for the Arts grant-funded ensemble that commissioned 11 new works in celebration of the 2016 U.S. National Parks Centennial. Holzman recently completed a studio-recording project of commissioned compositions, set for release by ArtistShare NYC in fall 2018. In 2016 Holzman formed and began serving as Music Director of the Upstate Brass Band, an exciting brass ensemble that performs in upstate New York, and was commissioned to record a series of new brass band arrangements by renowned composer/trombonist Bill Reichenbach. Holzman became the founding Music Director and conductor of the Hobart and William Smith Colleges Wind Ensemble in fall 2016. He successfully recruited and led the ensemble’s inaugural year, and it is now the college’s largest instrumental ensemble. After earning his MM in conducting at the University of Arizona (UA), Holzman had the opportunity to teach and conduct as Interim Principal Conductor for the Wind Symphony at UA’s Fred Fox School of Music during the director’s extended absence from 2012 to 2014. He also served as the Director and Coordinator of the UA Symphonic Band and High School Honor Band during his tenure.